Cambridge RF provides a broad ranging RF and Microwave power amplifier design capability based on Bipolar, GaAs FET and LDMOS FET technology and covering a wide range of powers, frequencies and applications. Amplifier solutions can range from single stage, single ended modules to more complex push-pull, wide-band, high power and multi-module solutions. Our staff have accumulated many years experience designing amplifiers for GSM, EDGE, and W-CDMA applications as well as for high-power microwave and broadcasting use. Cambridge RF serves the wireless infrastructure, communications, military and broadcasting market sectors. In addition to amplifier design, we also offer device characterisation, design studies, demonstration circuits, and full product support through the manufacturing phase. To address your design requirements, Cambridge RF utilises linear and non-linear simulation and electromagnetic CAD software, and has expertise in the design of linearisation architectures. We have the skills and equipment required to produce leading-edge multi-kilowatt designs, ready for manufacture. Our expertise embraces high power, high efficiency requirements as well as those for ultra-linearity and high gain. Cambridge RF has experience in handling the latest push-pull semi-conductor styles, many of which exhibit very low impedance characteristics and frequently require elaborate forms of impedance transformation and biasing. In addition to high power multi-module structures, our design team also has experience of feed-forward and Doherty techniques. Where high power multi-device solutions are required, we are able to support the total system design in terms of dedicated multi-port combiner design, for example, 3dB broadside coupled hybrids and Wilkinson type splitters/combiners. We are also able to undertake all aspects of thermal management and packaging using a variety of cooling techniques. Cambridge RF has experience of designs employing extruded aluminium heat sinks, low thermal resistance matrices, heat-pipes and forced-air cooling. What can Cambridge RF do for you? Whether your requirements are for semiconductor evaluation or complete system or sub-system amplifier design, Cambridge RF will be pleased to be your strategic design partner, work with you and provide advice as appropriate. Our track record in EDGE, W-CDMA, Broadcast and many other amplifier designs provides the starting point for our involvement in your project. The breadth of our background allows us to choose an approach that minimises development time, and maximises cost effective product design and performance, thereby enabling our customers to get better products to market faster. 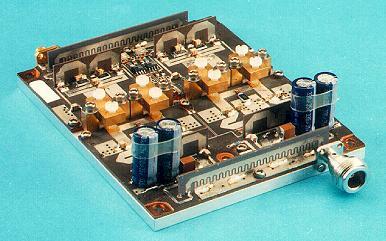 4.0 Mbytes 5/10/2003 high_power_pa_design.pdf - Information on RF & Microwave Power Amplifier Design Services from Cambridge RF in PDF format. 3.9 Mbytes 5/10/2003 linear_pa_design.pdf - Information on Cambridge RF's Linear Power Amplifier Design for 3rd Generation Infrastructure in PDF format.